LinkedIn just released its list of Top Companies for 2018. The list is formulated based on three pillars: interest in a company’s jobs, interest in a company’s brand, and employee retention. 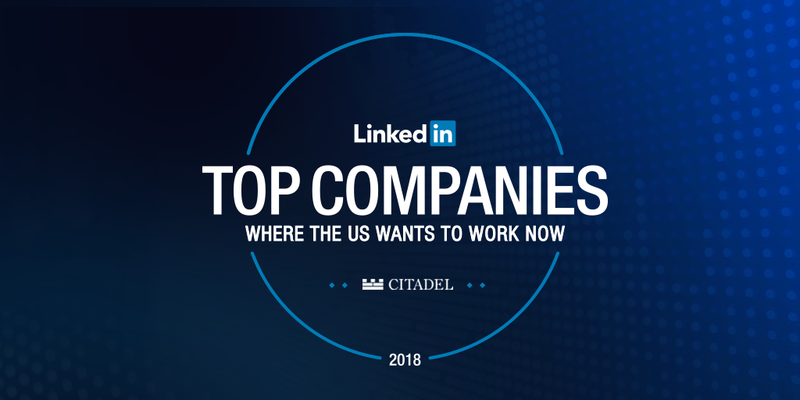 Citadel is proud to be represented on this list and, more broadly, we’re proud of the high-performance culture we continue to cultivate. As soon as we received the news, we sat down with L.J. 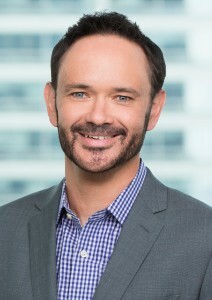 Brock, Chief People Officer of Citadel, to talk about what characteristics you should look for in a top company. L.J., congratulations to you and your team for helping the firm earn this distinction as a LinkedIn Top Company for team members. What characteristics should someone look for in a top company? We want to make sure the best and the brightest can maximize their career potential. We earned this recognition because our aim is to be the most successful investment team in the world and our exceptional colleagues are connected in this pursuit of making it to the “top.” For those who are determining where and how to make it to the top of their profession, I would recommend considering three criteria for a company to make your list of top possible employers. First, and foremost, top companies are meritocracies. They empower and reward team members who deliver results, regardless of title or place in the organization. Ask people how success is measured at their company. If the answer is articulated in terms of impact, you’re on the right path. Second, top companies empower you to own your career from day one. Specifically, they focus on helping you accelerate your career with different types of challenges and responsibilities instead of focusing on prescribed career paths and rigid timelines for promotion. Look for employers like Citadel that offer employees a myriad of ways to identify and take on new and different opportunities. Third, top companies expect high-performance from all teams and individuals. At Citadel, for example, every colleague, whether they sit with an investment team, a technology team, or corporate operations, is expected to commit to high-performance and continually raising the bar for what is possible. This expectation is what will allow you to continually learn, innovate, and develop a competitive advantage for your career – as well as for the company. For a company to truly embody a high-performance culture, the expectation of excellence must permeate every aspect of the organization. How does someone discover if a company has these characteristics? Talk to someone who successfully made it to the level up from the role you’re looking at. You want to better understand what allowed them to succeed and what next steps you should take. Talk to someone who made a lateral move and is enjoying their new role. You want to work with a company that finds ways to personalize career trajectories. If a firm does not give you access to these types of individuals, go find them on LinkedIn and other platforms. Ask hard questions to recruiters and hiring managers about the ins and outs of the role. Finally, we often speak about how Citadel is focused on winning tomorrow instead of looking back at the past. Can you provide one example of what the best and the brightest should look for in a company to have confidence that they are peering forward instead of backwards? Ask companies about how much of their time is spent on continuous improvement. Follow up to determine whether the process for continuous improvement is focused on a top-down, hierarchical approach or an approach that fluidly brings together team members across levels and departments. The culture of a top company should facilitate interactions between senior executives and team members who are steeped in the details of specific issues and opportunities. In summary, if you are able to come in, at any level, and work with others regardless of title or team, then you’ve got a company where everyone is committed to winning every day. If you’re ready to aim for the top, check out our career opportunities at https://www.citadel.com/careers/open-positions/.